Since the exit of Supreme Verdict, players who enjoy resetting the battlefield have struggled to find an ‘always good’ sweeper. Crux of Fate and End Hostilities were too late at five mana, unless you’re the only dragon owner in a control mirror. Drown in Sorrow and Anger of the Gods just never seemed to get everything in games two and three. Now, I feel Languish is filling the void at the CMC we expect from a sweeper. 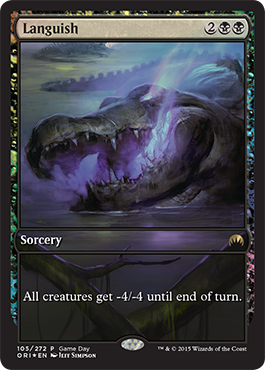 Sure, it’s not the Damnation reprint everyone and their mother speculate during every spoiler season for the past year, but this should be powerful enough to asset in shaping the future metagame. The list of creatures it kills is long and probably not worth talking about. The list of creatures it can’t kill are far more important. This could give hints on speculation-worthy rares for new Standard. Languish doesn’t Kill, but rotates: Most Theros gods (if active), Doomwake Giant, Polukranos, World Eater, Reaper of the Wilds, M15 Soul/”Titan” Cycle. Languish doesn’t kill, and doesn’t rotate: All Dragondlords (except Ojutai), Erebos’s Titan, Gurmag Angler, Siege Rhino, Tasigur, Archangel of Tithes, Sagu Mauler, Sidisi, Undead Vizier, Surrak Dragonclaw, Woodland Bellower, and Ashcloud Phoenix (4/1 mode). Clearly not a lot of speculation prospects listed above. Some have multiple printings, don’t have enough power for consistent Standard play, or are already expensive. Elves and goblins have a lot of hype but both easily fall to a well-timed Languish. 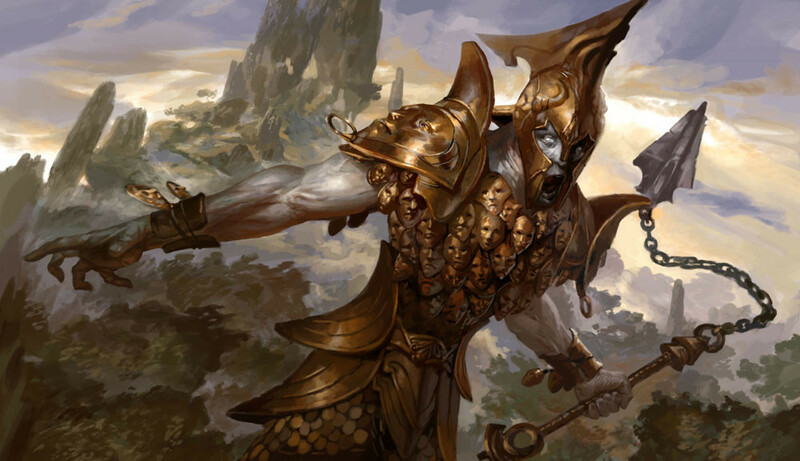 Abzan Midrange or Control will improve with the addition of Languish alongside metagame removal. Green-based devotion strategies will fall out or favor due to their dependency on early mana dorks. 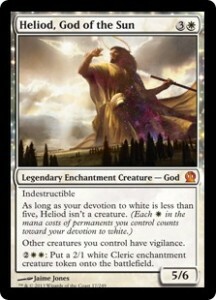 White devotion receives Tier 1 potential with Heliod and Archangel of Tithes at the top end of the curve. Brimaz and Wingmate Roc advance the board without over committing. Banishing Light and Chained to the Rocks (if splashing red) remove problems while also increasing devotion. Black devotion receives tier 1 potential. I made many of these validations in last weeks article , Financial Five: Magic Origins. Erebos’s Titan along with the other returnable creatures help recover devotion without losing card advantage. 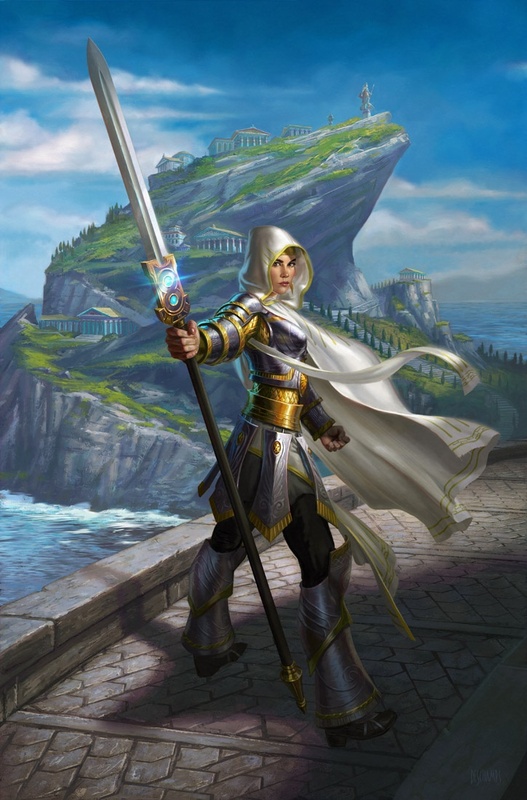 Elspeth, Suns Champion ($6) – Even though she has two printings and will be rotating in a few months, she’s still a powerhouse. Languish encourages players to play larger creatures. Elspeth wipes out those creatures. Ajani, Mentor of Heroes ($10) – Potential value without being affected by Languish and also fits in decks that want to play Languish. Tasigur, the Golden Fang ($8) – You should already be picking up this card anyway. Surviving Languish is just added to the list. Knight of the White Orchid ($3) – Increasing or quickly recovering devotion while continuing to curve out. Heliod, God of the Sun ($2) – Easier to turn on with Origins printing Knight and Angel. Anafenza, Kin-Tree Spirit ($2) – Rewarding you for playing creatures and might even pull a few creatures out of Languish range. Brimaz, King of Oreskos ($10) – One of the best creatures to cast on an empty board. Best post-Languish play. Wingmate Roc ($2.75) – A powerful top end to take advantage of your Nykthos. 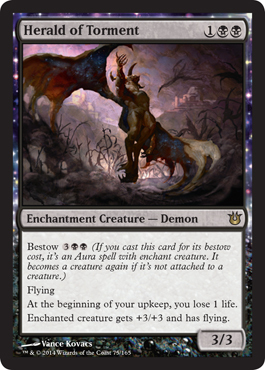 Despoiler of Souls ($1) – Recurring devotion plus reasons from last weeks article. Bloodsoaked Champion ($1.75) – Recovering devotion plus reasons from last weeks article. Herald of Torment ($0.25) – Bestow allows sweepers insurance, evasion, devotion assistance. Master of the Feast ($1.25) – Survives Languish, blocks most dragonlords, evasion. Languish doesn’t guarantee a defined Standard meta, but it does serve as an arrow pointing us in the right direction. From past experience, the influence of removal has on shaping the meta. It hasn’t always guaranteed a profitable spec, but it does happen an above average amount of the time. Clearly, the largest Standard card pool is going to increase my chance of overlooking deck potential, but we can learn a lot from past Standards. Look at the influence of Hero’s Downfall over the past year. Look at Lightning Bolt or Abrupt Decay and their influence on shaping the eternal formats. 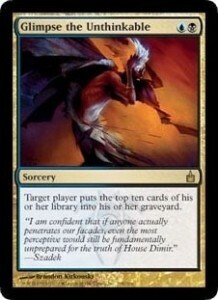 Also, with the thought of rotation haunting the back of your mind, that doesn’t mean it’s time to dump anything Theros. Understanding the potential movement of Standard can set up optimal opportunities to dump rotating staples at key moments before they actually crash at the Battle of Zendikar release. I might say it in every Financial Five article, but they just keep getting better and better at pricing cards. Though I applaud them, I think I still found some potential gems in Magic Origins worth speculating on. I understand at first glance his stats are underwhelming. What justified his inclusion in this weeks FF can be wrapped up with one word. Deathtouch! Almost any creature in the format would laugh at a 1/4, but deathtouch puts the fear in both Dragonlord Ojutai and Silumgar, the Drifting Death. Though his ability begs to be built around, it’s really not that hard in Standard to put creatures in the graveyard. He even works well with Fleshbag Marauder and Satyr Wayfinder. The only roadblock I can forsee in his future is Deathmist Raptor. The dino’s synergy with Den Protector would be the only leash holding back Standard play. If you couldn’t already tell, this is my favorite card in the set. He’s currently at $1 but is begging to gain value if Deathmist decreases in play. Funny sidenote: Did you know Graveblade is a font? Here’s proof. 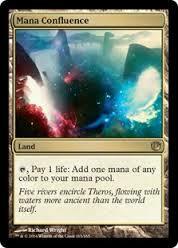 We are familiar with constellation decks from Theros block. 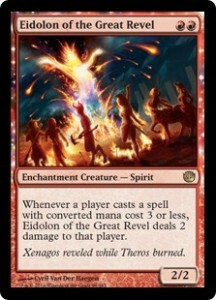 G/B constellation was a tier one deck for a while and I think this will at least encourage some great minds to test this cards potential with that theme. Currently at $3, it’s already pulling a small amount of hype in its direction. Gaining life ‘enchantmentfall’ shoudn’t be overlooked. The obvious combination with Courser is sweet, but the 2/2 body is its clearest drawback. Assuming you’re starting with the old G/B shell, Eidolon of Blossoms is a four of, but more importantly, another playset of 2/2’s. Blocking profitably is not going to happen often so finding a way to win without taking dragons to your face is the first puzzle you have to solve. On the surface, it seems too slow for Heroic decks. Plus, Hero of Iroas lines up better with the decks goals. With the Pro Tour Origins kicking off on July 31st, I’d say all it takes is a deck tech to double it’s price. 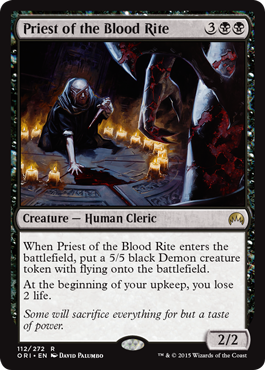 If Satyr Wayfinder isn’t enough fodder for you Sidisi, Undead Vizier or Fleshbag Marauder? I present to you, fodder and a Dragon-destroying Demon token (except Atarka, of course). Unless you’re playing FNM, Encase in Ice is the only ‘Pacifism’ effect in the current competitive Standard meta. Since you’re already playing Wayfinder, what else goes well with self-mill strategies? Whip of Erebos! Whip takes away the drawback, adds lifelink to your 2/2, and leaves behind a 5/5 flying demon. Together, they block Whisperwood Elemental and it’s first manifest creature well. My only concern is the number of copies worth playing in a list. It clearly works best in the self-mill decks (Golgari or Sultai) but at a non-mythic rarity, it’s hard to expect a large jump even after heavy play. Current price is $1 so a $4-5 price could come true if a whip deck finishes well in the next 2 months. This was actually the hardest card for me to add to the list. When it was first spoiled, It seemed way to narrow for my tastes and would end up being a meta call sideboard choice. It’s grown on me the more and more I think about it’s potential. It’s easy to think about when cards are good but will it be good more times than the times it’s bad. The fact that it’s a cantrip takes most of the sting out, but did keeping two mana up on your opponents turn put you behind? Probably not. So what are the good times? It prevents reanimation, tokens, manifest, blinking, unearth, and Splinter Twin combo. Modern and Legacy benefit the most but Standard could justify a few sideboard slots. I feel U/W/R modern decks benefit the most. With Preordain and Ponder banned, these decks rely on cantrips to keep their hands full. Most of these strategies also play most of there spells at the end of the opponents turn. 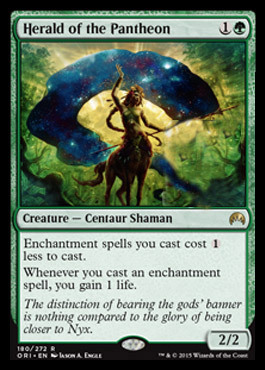 Problem is, rarity and lack of main deck potential turns this card into a long term spec. 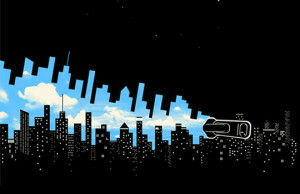 Think of it to take a similar financial path as Shadow of Doubt. $3.50 is the current price but I’d say you can pick them up off standard players for less during the Prerelease and release weekends. I can’t help but look at devotion potential when I see this little guy. Grey Merchant of Asphodel (Gary) is one of my favorite cards from Theros block. Bloodsoaked Champion and D-Souls will obviously have great aggressive potential for Mono-Black Aggro, but the ability to bring back creatures to keep devotion high could lead to some explosive turns. 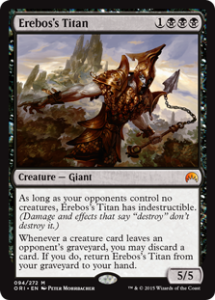 On top of those, Erebos’s Titan might not come from graveyard to battlefield but with devotion high, recasting him should be easy. D-souls easily fits in two known archtypes, encourages you to play with a playset, and is currently prices at $1. 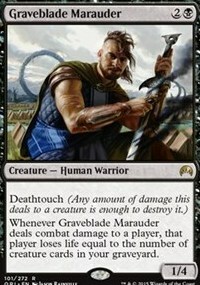 This price baffles me just as much as Graveblade Marauder. Yet another card that can only go up from here. If you can’t tell, black is my Magic Origins sleeper color. If I though other cards in other color had more potential, my article would be a bit more colorful. Alas, black is receiving additions in a variety of strategies and deck styles. 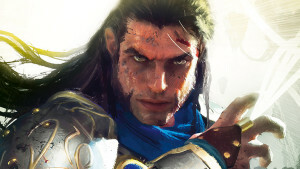 Cards that support these strategies could also see a rise but I wouldn’t underestimate what Liliana’s newly tainted necromancy will bring to the next two months of Standard. One evening, after work, I received a text saying, “They’re here. Want to come over?” It was from my future roommate letting me know his dad’s Magic cards from California had arrived. All he told me about was, “They’re f*%&ing old.” That’s more than enough to get me excited to go digging for buried treasure. After picking through the collection I found a few competitive gems, like both Sword of Light and Shadow and Sword of Fire and Ice, but most of the value settles in multiple playsets of Glimpse the Unthinkable and Doubling Season. Keep in mind this was 2013 so Doubling Season was $30+ and Glimpse the Unthinkable was $25 (lower than it is currently). Stacks of other “casual” cards were quickly turning this collection from hundreds to thousands in less than a half an hour. After we finished he said, “I bet you need a lot of this stuff, don’t you.” I replied, “To be honest, just the two swords.” After a confused expression was thrown my way I tried to explain the best I could. 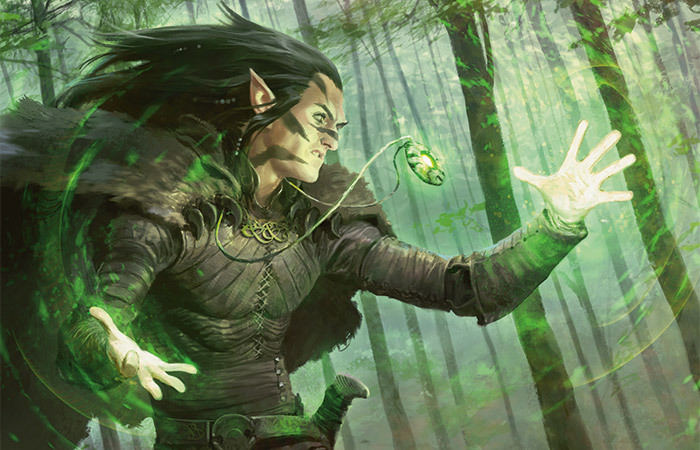 “Card value doesn’t always reflect the tournament playability of a card. Sometimes less competitive formats can have just as much demand.“ I talked more about the limited amount of MTG financial knowledge I had and explained the effects of reprints (or lack of), bannings, unbannings, and the varying stability of different formats. It sounds impressive when I list it like that but I promise it wasn’t. I still had a lot to learn as well. I didn’t give casual card value anymore thought until I started working at my LGS. Valuable Commander cards and casual cards many times overlap, but the growth of Commander was starting to apply more pressure on our inventory. I made or filled up all the $1, $2, and $3 binders with these styles of cards and had a hard time keeping a few cards in stock. I went even deeper by placing cards like Dream Twist in the case for .50 next to Traumatize and Mind Funeral. This experiment also brought some success. Last week I thought about what qualifies a casual card. The closest place to find kitchen table decklists is TappedOut but we don’t have a place to see how those players deckbuild. It’s doubtful they have trends and meta changes cause every kitchen table is different. Most of the time you play with what you opened in packs and buy a few more to make it a little sweeter. I wanted to find a way to find those extra cards. Single sales is probably the best way to determine but I don’t have access to online retailer’s sales statistics. Closest thing I thought of was buylists. When I was at GP Nashville I saw “Quicksilver Amulet” for $3 on a buylist. I had a bunch in a box at home but never thought adding them to my backpack for the day would make me money. Any financier understands the value of a buylist but I doubt that will unlock all the casual desirable since each inventory varies by retailer. So, I attempted to breakdown each theme that qualifies a potential gainer inside the casual market. Committed Themes – Cards that are good at one thing and help achieve a basic/simple goal. 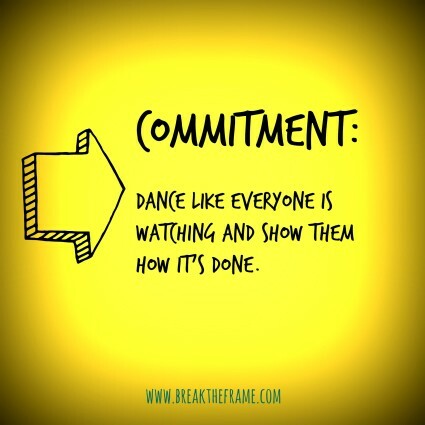 These decks are built with cards that revolve around this commitment. Lifegain – Gain life until to you make a 10 min. game into a 5 hour game. Mill – Forcing your library into your graveyard until you can’t draw a card. Douchbaggary – Strategies that deny your opponent the ability to play Magic. Land Destruction – You can figure this one out. All Counters – Counter everything you play without having a game plan to actually win the game. Over Taxing – Effects, permanents, or creatures that make casting spells cost an additional amount of mana or require paying mana to allow your creatures to attack. Synergistic Themes – Cards that require assistance from other cards to achieve a more complex goal. Tribal – Any card that cares about a creature type. Goblins, merfolk, and elves, Lorwyn Block, slivers, wizards, rebels, etc. Usually involve “lords” that grant abilities or extra power and toughness while they are on the battlefield. 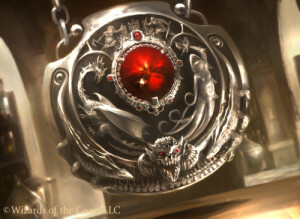 Tokens – Creating a wide token army combined with equipment or enchantments with “lord” effects. 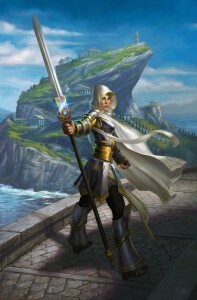 Identifying the most popular archetypes was my first step in identifying the casual cards with the most gain potential. Desired commons and uncommons can hold foil value like the Foil Invasion Heroes’ Reunion ($2.50) or Foil Hedron Crab ($8). These are prices an everyday player or store might not be aware of. Sadly, gaining value on casual cards takes patience but at least they’re the easiest to pick up. Adding potential casual cards to your mental list of cards to pick from collections, might surprise your wallet later. I actually have a thousand count box to place these investments in. My Non-Standard binder isn’t shy of casuals like Isochron Scepter and Browbeat either. I practice what I preach. In Casual Gains #2: Identify, I’ll talk more about specific cards and prices inside each theme. I hate to be first drop before the waterfall, but I can’t help but think ahead. We might know October 2, 2015 as the first day to spend our paychecks on Battle for Zendikar, but it’s also the day most of your Theros Block and Magic 2015 magically turn from dollars to pennies. Just the word ‘rotation’ makes Standard players cringe worse than the last time I cursed in Sunday school. I know you’re thinking, “Dude! It’s June! Why the hell are you writing about rotation?” In my experience, it’s a lot easier to complete trades with rotating cards when players don’t have rotation on the mind. You’ll start noticing that ‘keep staples’ mindset right when Origins releases. Everyone will start hoarding what rares they feel will hold value and start going out of their way to unload the rest before it completely tanks. This makes Pre-Origins the best time to pick up rares that will keep or gain value after rotation. Also, if Standard is the only format you play, the rest of this article is not for you. Keep in mind these are cards worth keeping for competitive play, not casual or EDH. Otherwise, I’d just say trade for all the gods. Courser of Kruphix – I know has only been a two-of in a few successful Modern lists. It falls to Abrupt Decay but survives Lightning Bolt. 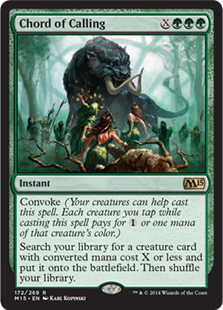 It’s dead weight against combo but great for creating card advantage and hitting your lands for the late game. You know it’s power if you’ve only playing a few matches of Standard. 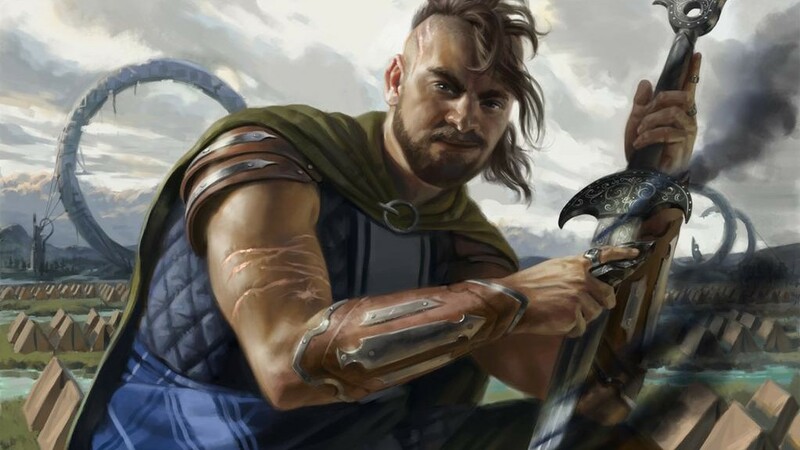 Speculating on a Bant control deck utilizing Courser might be a stretch, but labeling it as unplayable doesn’t seem correct either. The current $6 price might still be a bit high, but picking up a playset for $12 at rotation shouldn’t be a bad investment. This might be the only card on this list that’s worth waiting for a lower price. Currently $6 Fair Trade Price. Spirit of the Labyrinth (FOIL) – Why foil? Cause, Legacy. Legacy players love foils and Legacy foils love having oddly high prices. Foil Spirit has been a steady $10 while only seeing 1-3 copies in successful Death & Taxes lists. In May, it dropped to $6. D&T hasn’t put up many high places finishes in a while. But, if you play Legacy, you know the meta is always changing. It’s only a matter of time before it falls back into favor. With zero play in any other format, Spirit’s price has been solely dependent on the Legacy environment. This is a good time to pick up while you can still find them. Currently $6 Fair Trade Price. 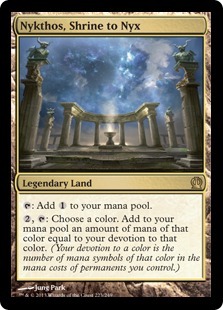 Mana Confluence – This upgraded City of Brass will continue to take its place in Modern and Legacy decks. It’s been as high as $20 but has mostly stayed around $10-12 during its lifetime. I don’t predict them going that much lower but wouldn’t be surprised to see them follow a slightly slower price trajectory as Cavern of Souls. 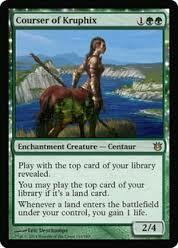 Plus, it’s a powerful non basic land. Always a worthy investment. Currently $12 Fair Trade Price. Eidolon of the Great Revel – Probably the best eternal playable card printed in this block. It sees four copies in both Modern and Legacy Mono-Red lists and will continue to do so. Picking up these should be just as obvious as picking up Thoughseizes. To be honest, you probably should have picked them up when they were $5. Currently $11 Fair Trade Price. Chord of Calling – Chord fell from $40 to $20 after its M15 reprint and has steadily decreased slowly over the past year. Previously played alongside the villainous Birthing Pod, Chord fell when Pod was banned and never found a home in Modern Collected Company decks. Its lack of recent play doesn’t reflect the power of this convoking tutor. Though Pod won’t be unbanned anytime soon, I think Chord will learn to stand on its own again in a future Modern meta. Zero chance this card falls to bulk after rotation. Currently $5 Fair Trade Price. Investing in rotating rares isn’t the quickest way to gain financial value, but it is a perfect way to acquire future format staples with a long term investment bonus. I might only have a few rotations under my belt, but I’ve made a lot of profit being patient with rotating cards like these. I hope now you can do the same before the ‘rotation plague’ sweeps over your LGS.